Most dogs live for a day at the beach, chasing frisbees, charging into the surf and running at their owner's side. But Henry's day at a Newport, California, beach must have seemed an agonizing eternity. 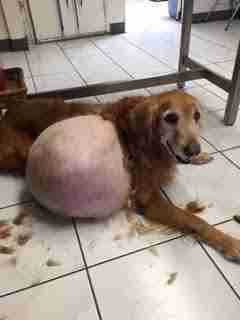 The dog was abandoned there last month - with a 46-pound tumor growing on his side. 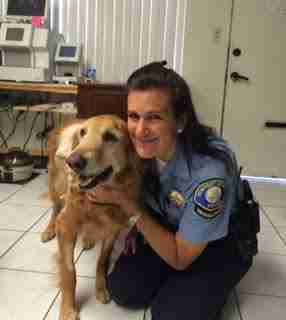 Valerie Schomburg of Newport Beach Animal Control got the call about a dog who had been dumped on the beach. She wasn't quite prepared to find Henry nearly crippled from the burden of his tumor. "It pushed on his right front leg, in his shoulder area," she tells The Dodo. "He was starting to have a difficult time walking because his front right leg was turned inward. Walking was a struggle for him." It's a good thing Henry wears his heart on his tail. He connected instantly with everyone he met. "He couldn't move around very much, but definitely still wanted to live life," Schomburg says. "He would bark, wag his tail, and then when you got close, he gave you kisses. His zest for life was still there. He was just weighed down a little." In Schomburg, Henry found everything he was missing - namely, a real person to stand by his side. 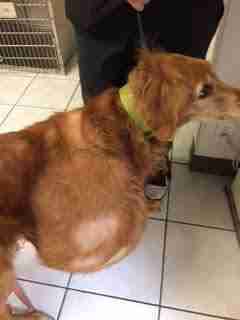 She even found money, through grants, for surgery on the dog's massive tumor. The tumor proved cancerous, but it hadn't spread anywhere else. 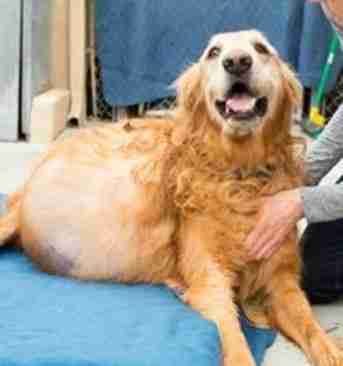 And with that weight lifted from his shoulders, Henry weighs just 78 pounds. "We think that he's going to have some real good years ahead of him," Schomburg says. "Nothing really slows him down. I think for so long, he was strapped down, that now he's making up for lost time." In about a month, a freshly unburdened Henry will be looking for a fresh start. It begins with a real family. "It's not going to hard to find the right home for him," Schomburg says. "It's going to be hard to pick one and then say goodbye to him." Once he's fully recovered from surgery, he will be up for adoption at the Newport Beach shelter. Visit the adoption page here.